AT MIDDLETON is a gentle romantic comedy starring Vera Farmiga (BATES MOTEL) and Andy Garcia (OCEAN'S ELEVEN) as two middle aged parents who fall in love while taking their kids (Taissa Farmiga and Spencer Lofranco) on a tour of Middleton College. The romance plays as a conventional odd couple love story, with Garcia playing a conservative doctor and Farmiga playing the more free spirited Edith. There are lots of rom-com conventions at play here. They meet in an argument and are initially dismissive of each other. There are lots of cute scenes where they discover they like each other. There's even the classic "he's afraid of heights but she'll help him" skit that we saw between Ryan and Marissa in The O.C. And yes, there's a cute and irreverent scene involving chopsticks. I also wouldn't have picked these two actors for a movie that involves physical comedy. And yet, and yet... There's something about these two actors that is authentic and the character of the doctor in particular is deeply sympathetic. And I also like that the children are given a story arc, but not an easy cheesy love story. The daughter in particular is fascinating - a high achieving kid who wants to study with a famous professor - and the meeting between the two is really worth watching. So I wouldn't say that this film is a must-watch but for a lazy Sunday afternoon it's somehow more than it seems. And by the way, the R rating is utterly unwarranted. 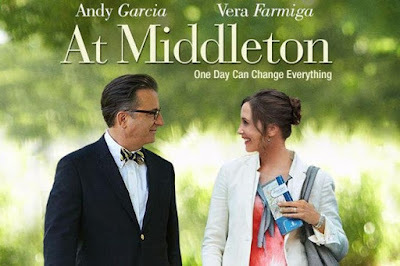 AT MIDDLETON has a running time of 99 minutes and is rated R. The movie is available to rent and own in the UK and USA and will be released in Spain on March 13th.